History writes that The Dakota Territory was split into two separate states because the population base had boomed so quickly in the 1880s, that the people were recognizing two separate capitals. Some of this dynamic was fleshed out in the HBO series Deadwood, one of the best TV dramas of all-time, and it just so happened to feature Timothy Olyphant as Marshall Seth Bullock: a complicated, unforgiving lawman with an itchy trigger finger. Sound familiar? Deadwood was regrettably discontinued after 3 seasons, but had it gone on, the matter of statehood would have surely been a central focus. On November 2, 1889, North and South Dakota were admitted as the 39th and 40th United States. But there's more to the story. There was so much rivalry and one-upsmanship between the Dakotas that while the states were admitted on the same day, President Benjamin Harrison ordered that the paperwork be shuffled so that nobody would know which executive order was signed first. Technically North Dakota is listed as the 39th state. Since only President Harrison and his Secretary of State James G. Blaine know for sure, North Dakota wins for the history books since it comes first alphabetically. This is all prologue for what took place in Sioux Falls, South Dakota, last night where the North Dakota State Bison took on the South Dakota State Jackrabbits. The Summit League Championship was on the line, and the automatic bid to the NCAA Tournament that goes with it. 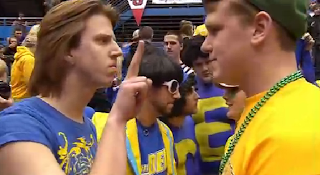 It was the biggest battle for state pride since 1889. South Dakota had the edge going in with All-America guard Nate Wolters, who scored 53 in a game earlier this season. With the season in the balance, Wolters managed only half of that number in a brilliant career-defining game on national TV. Wolters went around, through and over NDSU, finishing with 27 points, 6 rebounds, 6 assists, and 4 steals. And while the Bison cut into the lead late, they never could cross the border. 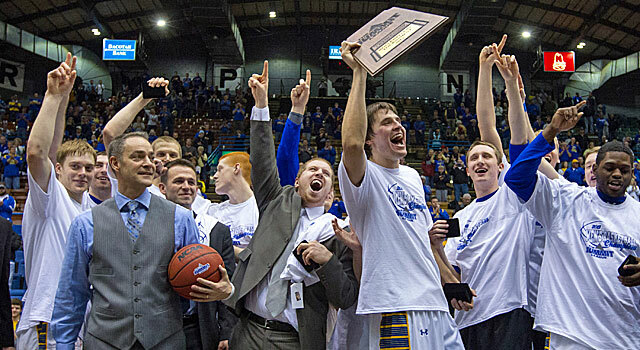 So Wolters and the SDSU Jackrabbits are headed to their second straight NCAA Big Dance. And while the state has obviously been in existence for nearly 125 years, the Jackrabbits will have a real chance as March rolls on to put the state of South Dakota on the map. So to speak.